Sales of fish, fruit and nuts are all up. SUPERVALU HAS HELD onto its top spot as the number one supermarket in Ireland with a market share of 25% according to the latest figures released today. Figures from Kantar Worldpanel show that Tesco is next in line with its market share hitting 24.2%, while Dunnes has 24.1%. Sales at Dunnes were 7% higher than last year – an increase of almost €3 million per week across the quarter. The average shopping trip now coming to €37.60, almost €2.50 higher than last year. The figures, which are for the 12 weeks ending 28 February, found that discount retailers Lidl and Aldi also continue to increase on their share of the market. Lidl had the biggest growth, improving their market share by half a percentage point. Over 66% of Irish households shopped in a Lidl store in the past 12 weeks, compared with less than 60% five years ago. 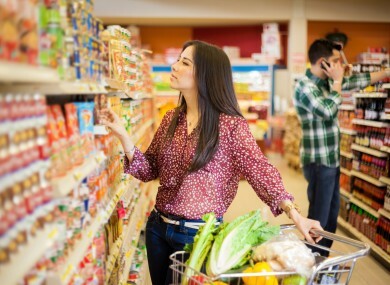 Director at Kantar Worldpanel, David Berry said, “Over the past twelve months we have seen a gradual increase in the level of price inflation, increasing from slight deflation of -0.1% in March 2015 to inflation of 2.6% in the past 12 weeks. “Interestingly shoppers don’t seem deterred by rising prices, increasing their spending well ahead of the rate of inflation. There are signs that the Irish public may be sticking to their new year’s resolutions, with healthy foods performing well ahead of the market. “Sales of fresh fish increased by 13% in the past 12 weeks, while fruit saw an 11% boost and sales of nuts have increased by 17% compared with last year. Email “Here's what we're buying and where we're buying it ”. Feedback on “Here's what we're buying and where we're buying it ”.